Wonder Boy © 1990 Sega Enterprises, Limited. 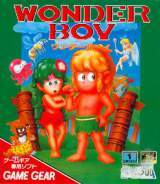 Wonder Boy was released on December 8, 1990 in Japan. Known in North America as "Revenge of Drancon [Model 2302]"
* Stage Select: At the title screen, press Down+START. You can then use Up and Down to choose the starting level.